I just planted a Nikko blue. When I bought it, some of the leaves were brown around the edges. I cut them off but now I have more leaves turning brown on the edges and kind of curling up. It's perky and looks good except for the bottom leaves. I live in Ohio. Pests are a problem on fruits, flowers and veggies. This is a sign that the plant is not getting quite enough water. 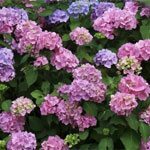 Hydrangea tend to need a bit more water than other plants, especially if they are planted in the sun. Increase water to the plant and that should get rid of the brown edges on new leaves.